So What Do You Do with Your Custom Corrugated Boxes After They Serve Their Purpose? Recycle them, of course. That’s obvious. We all know that generating post-consumer waste is nearly unavoidable in the retail market, but corrugated cardboard is an eco friendly post-consumer fiber that is easily recycled. And it’s place in retail as light-but-durable packaging is widely celebrated. But how are you going to recycle it? I’m not talking about the route you take to the recycling center. I’m talking about the step in between. You know about that step, right? The part where your post-consumer corrugated cardboard becomes the key to crafting? The doorway to imagination? I mean, you’ve heard about that, right? Custom corrugated boxes are eco friendly. But they’re also kid friendly. You’ve seen it before: some birthday or Christmas where the box gets more mileage than the toy inside. Kids love cardboard. Parents: don’t be discouraged by this–embrace it! Get that kid a box and let them go hog wild! 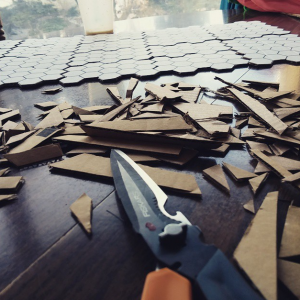 Recently, I wrote about how corrugated cardboard has been vital to prototyping my own board game. Yes, the cardboard box has become coveted in my household. Brown Gold, we call it. 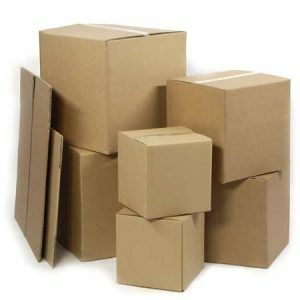 But it got me thinking: there’s a lot of awesome ways for kids to use corrugated cardboard boxes that can be quite beneficial to their creativity (and the environment). Here’s a few, just off the top of my head. Puzzles are one of the most timeless toys in history. Going to the store to pick one out is fun…but how about making one? Take a piece of corrugated cardboard and either draw right on it, or glue on a picture. Flip it over and sketch out the pieces. The cutting part might need a little supervision–or maybe an adult with an Exacto knife–but at the end, you’ll have a thick, sturdy puzzle made to your exact specifications. Definitely a good project for a rainy afternoon. Keep those scissors handy. 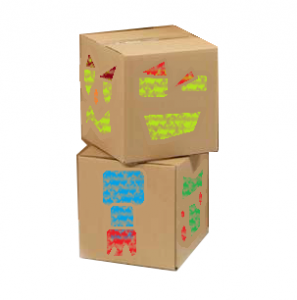 Break down some corrugated cardboard boxes and cut out a base for your sculpture. Essentially, you’re going to become a 3-D printer, crafting your little statue layer by layer from the ground up. Stencil out the next piece so that it fits within the confines of the base, and so on and so on. Eventually with a little stacking and glue, you’ll have a layer sculpture. A castle spire, the Statue of Liberty. You can even make yourself that Academy Award you’ve always deserved. Now this use for corrugated cardboard will really get you moving around! Breakdown a repurposed cardboard box or two. Or three, or four, or five. (A good old B-Flute RSC Box would be perfect.) Use the flaps as spaces for a giant board game. Get out the markers and crayons to add rules and regulations to the spaces. Collect 200 Pennies or Win a Candy Bar or whatever! Half the fun of making a board game is making up the rules. And making a giant, fully-interactive board game that can go around the house, through the yard, or all of the above will definitely getting the creative motors running. And don’t forget the giant cardboard box dice! Sure this is fun for kids, but it’s also good for parents, right? Use some repurposed cardboard boxes to create a den of storage cubbies. Or turn existing shelving a little more personal and private by creating custom drawers for each member of the family. Everybody needs more space. Stack’em up and see that precious floor space you’ve been missing! I use this a lot in my board game design when I need to draw a particular shape or symbol over and over again. Take a sturdy piece of corrugated cardboard and cut out a cool shape. Now you have a template for drawing shapes again and again, and the best part is they’ll be personalized to what you like drawing! Maybe you’re a 5-leaf clover fan, or partial to crescent moons! The options are endless! I don’t think a day goes by that I don’t suggest making a robot to someone. But a custom box made of corrugated cardboard makes the perfect robot parts. 5 or 6 of them stacked together make for all the components of a robot. With very sizes and shapes of boxes, you can make a pretty unique bot. Make it a mini, or life-sized. Just try not to give it artificial intelligence–I’ve heard that ends poorly. Whew! That should hold you for awhile, right? Two rainy saturdays, at the very least. These ideas are all fine and well, but it’s important to remember what it means for the environment. Every time you get a little more use out that custom packaging or corrugated box before the recycling bin, you’re contributing to the fight against post-consumer waste. Granted the eco friendly nature of corrugated cardboard plays its part in that battle, but why not get something creative out of the deal while you’re at it? After all, it’s a lot easier to utilize something than figure out how to properly dispose of it.